Manchester United goalkeeper David de Gea is reportedly asking for around £300,000 a week to sign a new contract at Old Trafford. The Spain international is one of the finest players in the world in his position and a hugely important part of this United squad, but his future has been up in the air for some time now. De Gea’s current contract is due to expire at the end of next season after the club activated a clause to extend it by a further year, according to the Daily Mail. The latest on the 28-year-old is that he seems open to remaining with the Red Devils, but they’ll clearly have to pay up if they are to prevent him leaving, according to the Mail. 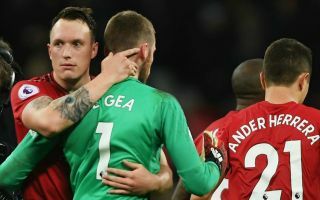 One imagines De Gea would have offers from all over Europe the sooner he came towards the end of his contract, so United would probably be wise to just get this out of the way and meet his demands. De Gea was in stunning form for MUFC in their 1-0 win over Tottenham at the weekend, producing a number of big saves to preserve the three points and the clean sheet.